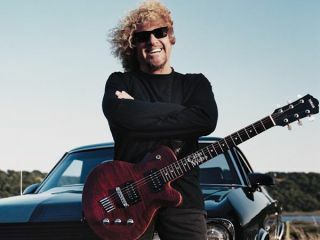 Hagar: Eddie was "poisoned, vulnerable"
Sammy Hagar already left Van Halen once in the mid-'90s, but as he said to MusicRadar, he was convinced to come back for a 2004 "Van Hagar" reunion tour. It was a sell-out success, but things went sour quickly, and as Hagar reveals, "I think it's because somebody got to Eddie. Somebody poisoned him." As Hagar told MusicRadar, "It got to the point where I was the leader of that band. Eddie was a humble, meek guy. Greatest guitar player in the world, but not a leader. I would write the lyrics, and Eddie was happy to just play guitar and play piano. But he woke up one morninig and he decided he wanted his band back. Like I was taking over and I was just the bad guy." Hagar chalks the problem up to Van Halen's then-new manager (whom he declines to name), who replaced longtime manager Ed Lefler. "From that moment on, everything changed," said Hagar. "If I said to Eddie, 'Let's do this at two o'clock,' Eddie'd go, 'No, no, I wanna do it at noon!' Then Alex would say, 'Noon...two o'clock,' and Eddie would go, 'Okay, one then!' If I said, 'I want the album cover black,' he'd go, 'No, no, no, I want it white!' I'd be like, 'Fine, white then,' and he'd go, 'No, no, no, it's gotta be black!'" In Hagar's view, Eddie's rampant drug use played another part in the downfall of the "Van Hagar" lineup. "There was always substance abuse in that band. Everybody drank and did this and did that. We had a pretty good time. I probably less then most. Al went completely sober. Eddie was the only guy who was really out there. [The new manager] came in and he got to Eddie, because he was vulnerable." You can listen to or download the full Sammy Hagar interview right here.